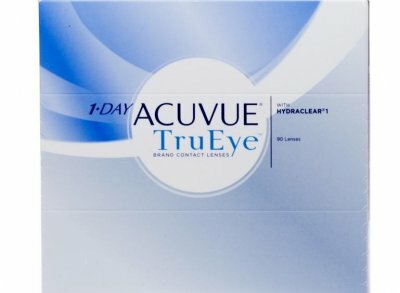 1-Day Acuvue Trueye 90 pack provide all day comfort for healthy eyes. Hydraclear technology. 1 Day Acuvue TruEye Contact Lenses are specially designed for the demands of your day and the health of your eyes. 1•DAY ACUVUE® TruEye® Brand Contact Lenses are a world first. With the fusion of superior oxygen delivery1, highest UV protection2 and ultra-smooth HYDRACLEAR®1 technology, no other daily disposable lens is better equipped to help you and your eyes meet the daily challenges of modern living. What makes 1•DAY ACUVUE® TruEye® so special? * Each lens is made from a unique silicone hydrogel material called narafilcon A which allows almost 100% of available oxygen to pass through to your eyes, helping them stay clear and white. * UV blocking2 of almost 100% UV-B and more than 96% UV–A. * The unique, wettable, ultra-smooth properties of HYDRACLEAR ®1 technology to help keep your eyes moist and comfortable.